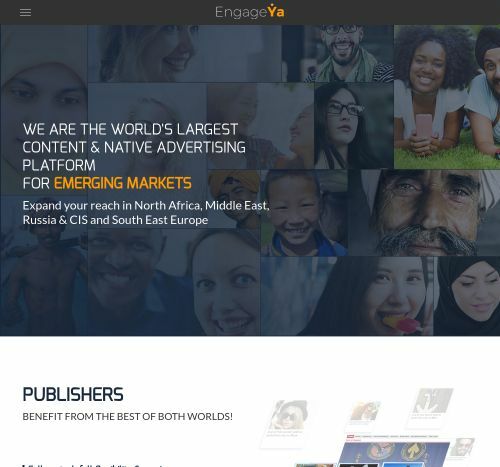 EngageYa is one of the best native advertising platforms for publishers and advertisers. The network of EngageYa generates over 40 billion monthly impressions covering East Europe, Russia & CIS, Middle East, and North Africa. EngageYa's publishers have full control and flexibility of how they can manage inventory to maximize revenue. Using the platform, publishers' key metrics will be boosted to the maximum with CTR up to 10%, traffic increasing by up to 11%. For advertisers, EngageYa offers a wide range of verticals such as Entertainment, Lifestyle, Fashion, Sports, Food, Parenting, Technology, News, Business, and so on. With a risk-free payment model, EngageYa guarantees that you will only pay for increased ROI. You can check EngageYa reviews on Affbank and ask EngageYa Team any question by using the contacts above, especially about how to earn money!